Derek Fildebrandt has a very, very bad week. 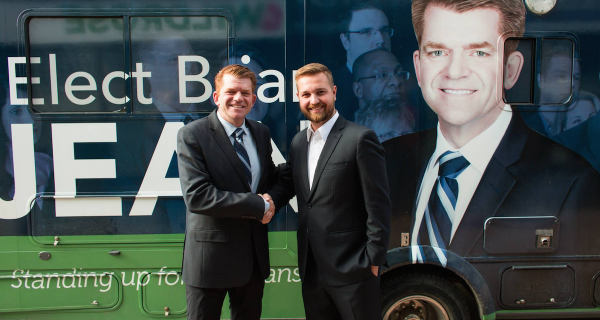 Photo: In happier times, as Derek Fildebrandt campaigned alongside Wildrose leader Brian Jean in Strathmore-Brooks on the first day of the 2015 election. (Photo from Brian Jean’s Facebook Page). Over the course of eight days, Strathmore-Brooks MLA Derek Fildebrandt went from being a potential leadership candidate to stepping down from the United Conservative Party Caucus. As a former spokesperson for the Canadian Taxpayers Federation and Official Opposition finance critic in Alberta’s Legislative Assembly, he had earned a reputation as a relentlessly partisan critic of the old Progressive Conservative and current New Democratic Party governments. His reputation as a fiscal crusader, and his political future, were put in question this week. August 8, 2017: Former Wildrose Party finance critic and United Conservative Party finance co-critic Derek Fildebrandt announces he will not run for the leadership of the new party. He tells reporters than he will instead use his United Liberty PAC to push the party and leadership candidates to adopt libertarian policies. He takes a direct shot at former Wildrose leader Brian Jean, now a candidate for the UCP, saying that “he is not the best man to lead the party and lead Alberta.” (Background: Jean attempted to suspend Fildebrandt from the Wildrose Caucus in June 2016). August 10, 2017: Fildebrandt issues a statement saying he plans to donate the $2,555 he earned through Airbnb to the provincial debt. ‘I’m not interested in letting the politics of smear distract from the real issues,’ his statement read. “Rather than focusing on complaining about people trying to smear him, he should acknowledge that it was a mistake and he should apologize,” Premier Rachel Notley tells reporters. Finance Minister Joe Ceci calls on Fildebrandt to apologize for his actions. “The public puts a lot of faith in their elected officials, and when people act like that I think they destroy that faith,” Ceci told reporters. 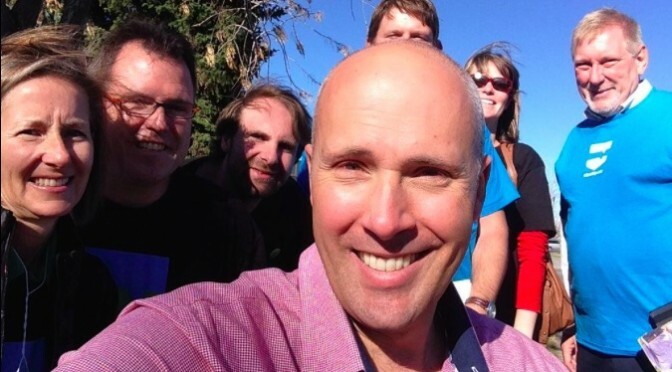 Alberta Party leader Greg Clark calls for penalties for MLAs who break reimbursement rules and writes to Legislative Assembly Speaker Bob Wanner to ask for an audit of all MLA living expenses. Late that night, Fildebrandt announces he is taking leave from his position as UCP finance co-critic and is leaving on vacation. August 15, 2017: CBC reports that ‘Edmonton police conducted an investigation and on June 14, 2016, charged Fildebrandt under the provincial traffic act with leaving the scene of an accident and failing to notify the owner of the damaged vehicle.’ Cooper tells CBC he did not know about the charge. The trial was adjourned until September 6, 2017, when Fildebrandt is expected to present his evidence. Late tonight, Fildebrandt issued a statement on his Facebook page where he took two swipes at the media before announcing his plans to leave the UCP caucus and sit as an Independent MLA. This entry was posted in Alberta Politics and tagged Airbnb, Alberta NDP, Alberta Party, Bob Wanner, Brian Jean, Canadian Taxpayers Federation, Derek Fildebrandt, Greg Clark, Joe Ceci, Meal Expenses, MLA Housing Allowance, Rachel Notley, Strathmore-Brooks, United Conservative Party, United Conservative Party Leadership Race 2017, United Liberty, Wildrose Party on August 16, 2017 by Dave Cournoyer. 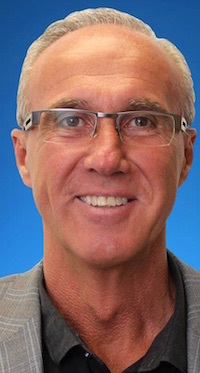 It is 10:20 p.m. and Conservative Party candidate Glen Motz has cruised to a crushing victory in the Medicine Hat-Cardston-Warner federal by-election. With 190 of 223 polls reporting, Mr. Motz had earned 69.3 percent of the vote, which is slightly higher to what the Conservative candidate earned in the October 2015 federal election. This is not unexpected, as voters in this sprawling southeast rural Alberta riding have a long history of supporting conservative candidates. Though in a distant second place, Liberal candidate Stan Sakamoto is set to have achieved a high-water mark for the Liberals in this riding by earning the highest share of the vote for the Liberals since since 1974. An impressive mid-campaign splash by Prime Minister Justin Trudeau, a first by a sitting prime minister since 1993, also prompted a visit by Conservative leader Rona Ambrose, a first by a Conservative Party leader since before 2006. Meanwhile, the New Democratic Party candidate, Bev Waege, is sitting at an embarrassingly low 1 percent of the vote, down from the 2015 candidate’s 9 percent. Neither the federal nor provincial parties appear to have put much, if any, effort into this by-election campaign. The lack of an NDP candidate until midway through the campaign also likely pushed NDP supporters towards Mr. Sakamoto’s campaign. The results are undoubtably a reflection of how voters in this deep southern rural Alberta riding (the heart of Wildrose Party territory) feel about the federal NDP opposition in Ottawa and the provincial NDP government in Edmonton (which is not encouraging news for Medicine Hat NDP MLA Bob Wanner). I expect Wildrose MLAs will try to blame Premier Rachel Notley for this poor showing, but anyone who has been paying attention to rural politics in this province over the past 17 months will not be completely shocked by this result. Shorter version: Not much has really changed. Carry on with politics as usual. The final results of the by-election can be found on the Elections Canada website. This entry was posted in Alberta Politics and tagged Alberta NDP, Bev Waege, Bob Wanner, Glen Motz, Justin Trudeau, Medicine Hat-Cardston-Warner by-election, Rachel Notley, Rona Ambrose, Stan Sakamoto, Wildrose Party on October 24, 2016 by Dave Cournoyer. 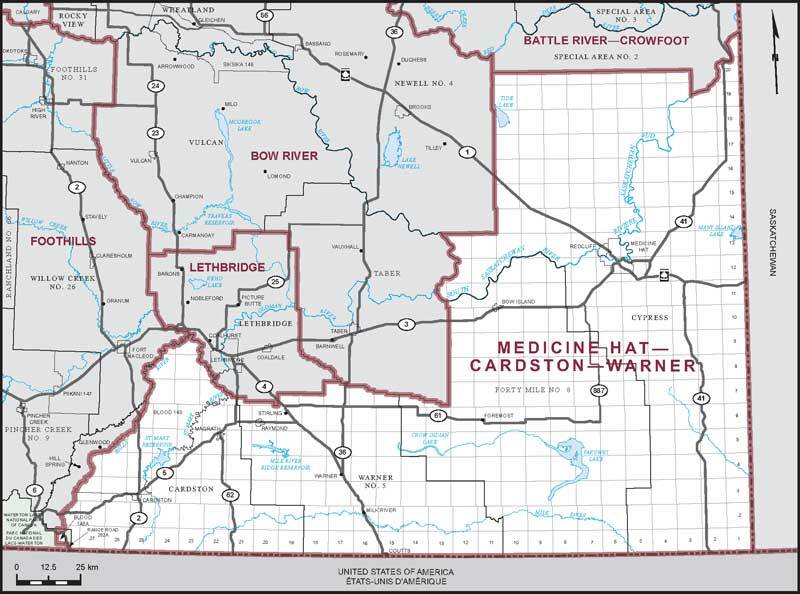 The map of Medicine Hat-Carston-Warner riding. Conservative Glen Motz and Libertarian Sheldon Johnston appear to be the only two candidates to so far step up to run in the upcoming federal by-election in Medicine Hat-Cardston-Warner. The by-election has not been called yet but it will be called within the next 40 days – on or before the six month deadline of Sept. 26, 2016. According to a story by iPolitics.ca reporter BJ Siekierski, neither the Liberals or New Democratic Party have nominated a candidate yet. Christian Heritage Party leader Rod Taylor will be touring through the riding on August 30 and 31. Barring a political earthquake, it is expected the Conservative Party candidate will win the by-election in this sprawling southeast Alberta riding with a large Mormon community and a strong social conservative base. 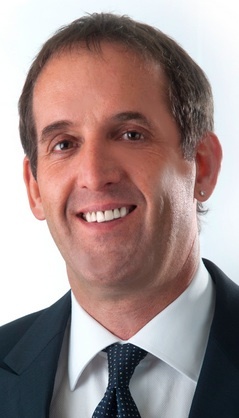 Former Member of Parliament Jim Hillyer, who died earlier this year, was re-elected on October 5, 2015 with 68 percent of the vote, compared to 17 percent for Liberal Glen Allan and 9 percent for NDPer Erin Weir. 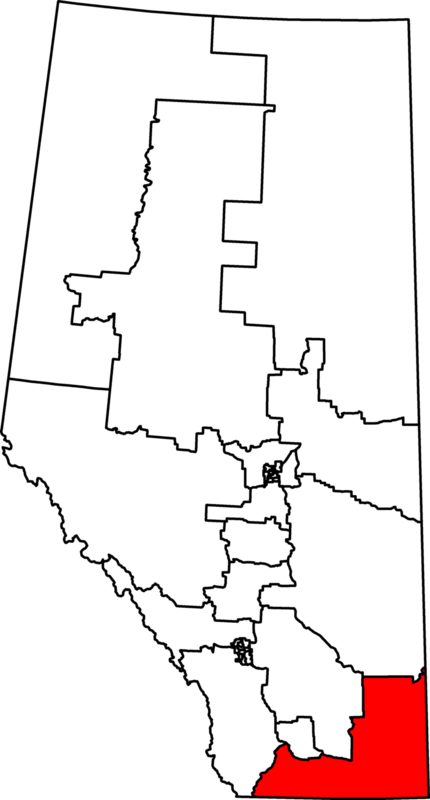 Provincially, the area covered by the federal riding is represented by Cypress-Medicine Hat MLA Drew Barnes and Cardston-Taber-Warner MLA Grant Hunter of the Wildrose Party and Medicine Hat MLA Bob Wanner of the New Democratic Party. Mr. Wanner is the Speaker of Alberta’s Legislative Assembly. This entry was posted in Alberta Politics and tagged BJ Siekierski, Bob Wanner, Cardston-Taber-Warner, Cypress-Medicine Hat, Drew Barnes, Erin Weir, Glen Allan, Glen Motz, Grant Hunter, Jim Hillyer, Medicine Hat-Cardston-Warner, Medicine Hat-Cardston-Warner by-election, Rod Taylor, Sheldon Johnston on August 17, 2016 by Dave Cournoyer. The Wildrose Party was not one big happy family this week. Albertans might be confused about what exactly happened between Wildrose Party leader Brian Jean and Finance critic Derek Fildebrandt. It might be one of the most bizarre political stories of 2016. Mr. Fildebrandt’s “suspension” and quick return to the Official Opposition Wildrose Caucus is being spun by party strategists as a reaction to a social media faux-pas but it is widely interpreted by political watchers as an internal power play to neutralize a potential challenger to Mr. Jean’s leadership of the party. An outspoken critic and a fierce partisan, Mr. Fildebrandt has been a opponent of nearly everything the New Democratic Party government has proposed since it formed government in 2015. But the second highest profile MLA in the opposition benches has also attracted his share of controversy. As Ontario Premier Kathleen Wynne was a guest at Alberta’s Legislative Assembly, Official Opposition Finance critic Mr. Fildebrandt attacked her record as premier as she sat in the Speaker’s Gallery. In reference to Saskatchewan Premier Brad Wall, Mr. Fildebrandt shouted “Invite Premier Wall here! Invite Premier Wall“ at Premier Rachel Notley as she tried to answer a question during Question Period. Ms. Wynne was in Edmonton to meet with Ms. Notley to discuss climate change and her potential support for the TransCanada Corporation’s Energy East Pipeline from Alberta to New Brunswick. A screen shot of a Facebook message began circulating on social media early Friday evening showing a comment from a supporter on Mr. Fildebrandt’s Facebook page referring to Ms. Wynne as “Mr. Wynne or whatever the hell she identifies as” – an apparent reference to the fact Ms. Wynne is openly gay. The author of the comment added that he was “proud to have you as my MLA,” and Mr. Fildebrandt initially responded, “Proud to have constituents like you!” Mr. Fildebrandt quickly apologized online, responding that he did not fully read the comment and that it was totally inappropriate. Mr. Jean issued a public statement around 11:30 p.m. announcing the suspension of Mr. Fildebrandt from the Wildrose Caucus because of the comments he made on social media: ‘This evening, Mr. Fildebrandt made an unacceptable comment on social media that does not represent the values of the Wildrose Caucus.’ This was seen a very serious and unexpected move by Mr. Jean, who was in Vancouver attending the Conservative Party of Canada national convention at the time. Mr. Jean faced criticism from a massive mob of party supporters online who were opposed to the suspension. Ms. Wynne accepted Mr. Fildebrandt’s apology for the Facebook comment. “But, you know, I think it was an interesting confluence of things. There’s a woman premier in Alberta, I’m there as a woman, we’re talking about climate change. And I think the attack, the viciousness of the attack, had a particular quality to it. 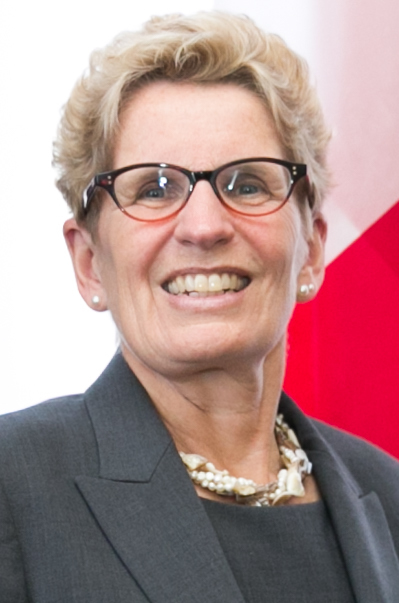 So, I will just say we need to pay attention to that,” Ms. Wynne told the Canadian Press. Ronda Klemmensen, President of Mr.Fildebrandt’s Strathmore-Brooks Wildrose constituency association spoke out against the suspension. 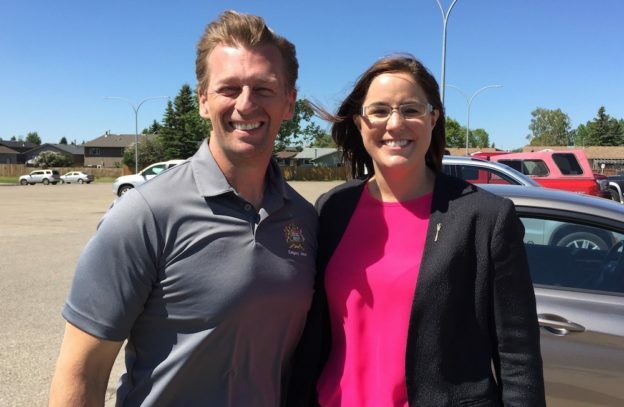 Ms. Klemmensen was backed by the Drumheller-Stettler Wildrose constituency association and at least five other associations that wrote letters in support of Mr. Fildebrandt. Lakeland Conservative MP Shannon Stubbs posts a comment on Facebook in support of Mr. Fildebrandt. Calgary-Shepard Conservative MP Tom Kmeic tweeted his support for Mr. Fildebrandt. You cannot make friends out of your enemies by making enemies out of your friends. @Dfildebrandt should be reinstated into #wrp caucus. 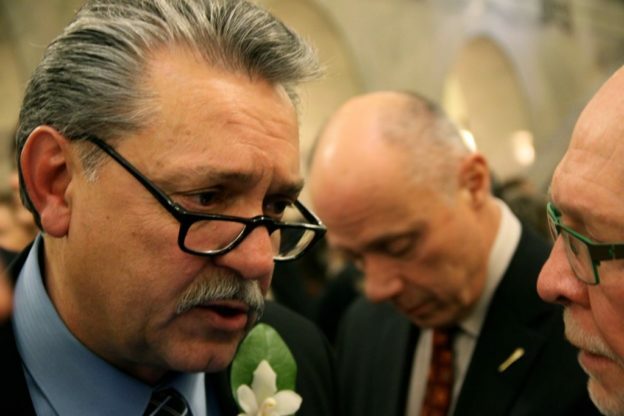 CBC journalist Kim Trynacity reported that Legislative Assembly Speaker Bob Wanner‘s office had never received official notice informing them that Mr. Fildebrandt was suspended, meaning he had remained a Wildrose MLA even though Mr. Jean’s statement claimed he was suspended. 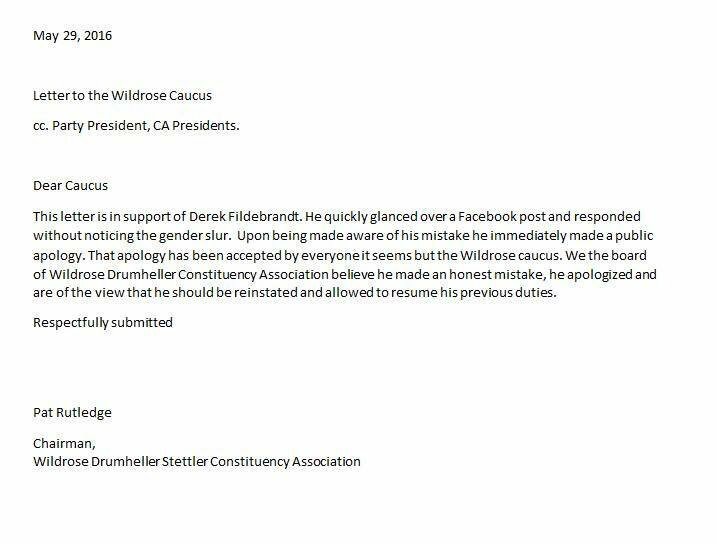 As of this afternoon, the Speaker's office in the #ableg had not received notice that @Dfildebrandt was suspended from the #WRP . Mr. Jean held a press conference announcing that Mr. Fildebrandt could return to the Wildrose Caucus if he took actions to behave himself on social media and met a list of secret conditions. The five secret conditions were not secret for long. 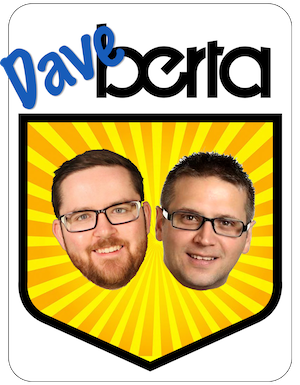 They were first reported on daveberta.ca and soon after by Postmedia. The conditions were: 1) He is suspended from the Wildrose Official Opposition Caucus until the end of the current Legislative Session. 2) He will be on probation until September 1, 2016. 3) He has to commit to personal improvement and personal development. 4) He would be prohibited from doing any media interviews except with local media in his Strathmore-Brooks constituency. 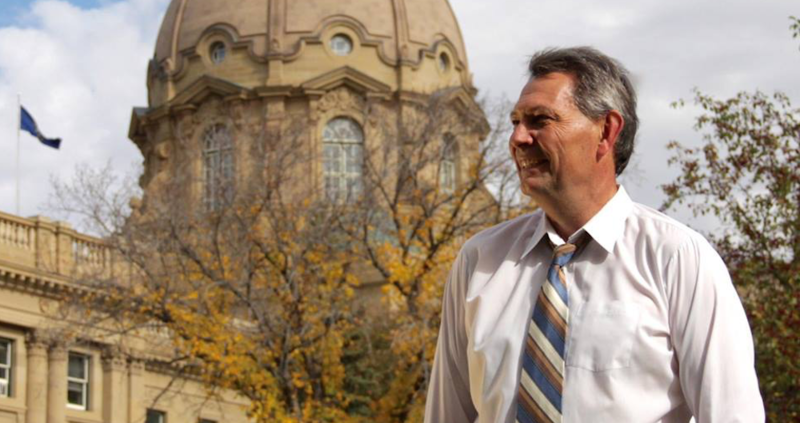 5) He will not be reappointed as Finance critic when he returns to the Wildrose Caucus. 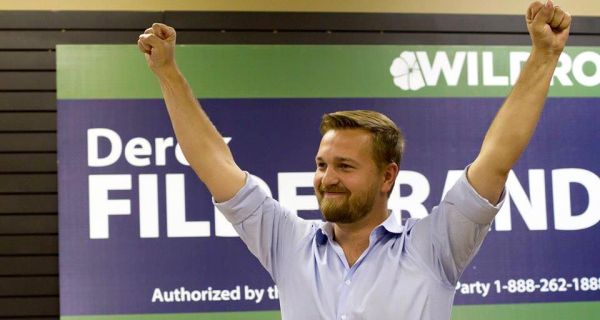 The Wildrose Caucus released a statement announcing Mr. Fildebrandt had been fully reinstated in the Official Opposition and had retained his post as Finance critic. The five secret conditions given to Mr. Fildebrandt on May 30 appeared to had been dropped and the only condition of his return was that he hire a staffer to manage his social media accounts. The Wildrose statement claimed five secret conditions reported in media were “not accurate” but sources close to Mr. Fildebrandt confirm the five secret conditions did indeed exist. 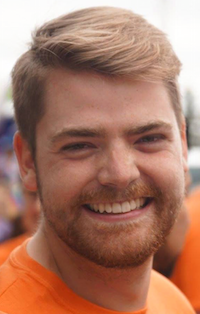 AlbertaPolitics.ca blogger David Climenhaga suggested that Mr. Jean may have violated the Wildrose Party constitution by how Mr. Fildebrandt was suspended. 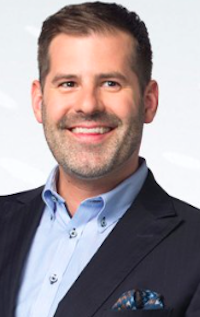 A close advisor of Mr. Fildebrandt’s, Jordan Katz, confirmed to Postmedia columnist Rick Bell that the secret conditions did exist and he questioned whether a quote endorsing Mr. Jean’s leadership in the Wildrose statement issued on May 31 was actually approved by Mr. Fildebrandt. Mr. Fildebrandt returns to the Legislative Assembly for the first time since his “suspension” on Friday, May 27. “There’s always going to be hurt feelings. I’m sitting down with people, talking one on one, face to face. And I think at the end of the day, we’re all going to come out of this stronger as a caucus and ready to go forward,” Mr. Fildebrandt told the CBC. This entry was posted in Alberta Politics and tagged Alberta NDP, Bob Wanner, Brad Wall, Brian Jean, Climate Change, Conservative Party of Canada, David Climenhaga, Derek Fildebrandt, Drumheller-Stettler, Graham Thomson, Jordan Katz, Kathleen Wynne, Kim Trynacity, Nathan Cooper, Postmedia, Rachel Notley, Rick Bell, Ronda Klemmensen, Shannon Stubbs, Strathmore-Brooks, Suspended MLA, Team Petulant, Tom Kmeic, TransCanada Energy East Pipeline, Wildrose Civil War, Wildrose Party on June 2, 2016 by Dave Cournoyer. Following the death of Conservative Member of Parliament Jim Hillyer on March 23, 2016, Elections Canada has announced that a by-election must be called in the Medicine Hat-Cardston-Warner electoral district before September 26, 2016. The earliest a by-election could be held is May 16, 2016. A map of the electoral district. By-elections can produce unexpected results, as we have seen recently in Alberta, but as one of the strongest Conservative voting areas of the country, it is very likely the next MP for this area will be a Conservative. Mr. Hillyer was elected in October 2015 with 68 percent of the vote, ahead of Liberal Glen Allan with 17 percent and New Democrat Erin Weir with 9 percent (not that Erin Weir). Conservatives partisans in this region of Alberta tend to occupy the social conservative side of that party’s coalition. But that does not necessarily mean they are united. 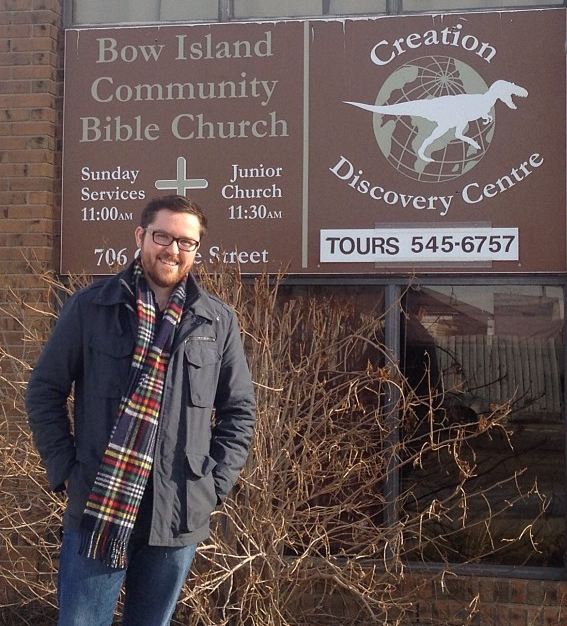 The author of this blog outside the Creation Science Museum in Bow Island, Alberta. This electoral district spans the beautiful stretch along Alberta’s southeast boundaries with Saskatchewan and Montana. The large rural district includes the City of Medicine Hat (a city of 63,000 residents), Canadian Forces Base Suffield, the Blood Indian Reserve (the largest and second most populated reserve in Canada), a large community of followers of the Church of Jesus Christ of Latter-day Saints, and the Bow Island Creation Discovery Centre. The area was represented by Conservative MP LaVar Payne from 2008 to 2015. 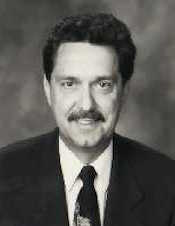 Former cabinet minister Monte Solberg represented the area as a Reform Party, Canadian Alliance, Democratic Representative Caucus and Conservative MP from 1993 until 2008. 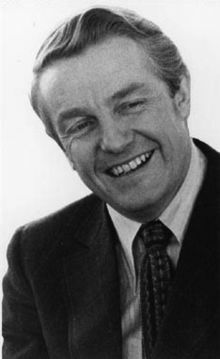 Former Social Credit MP Bud Olson was re-elected as a Liberal MP in 1968 and served as Minister of Agriculture in Prime Minister Pierre Trudeau’s cabinet until his electoral defeat in 1972. The riding became a Progressive Conservative stronghold from 1972 to 1993. 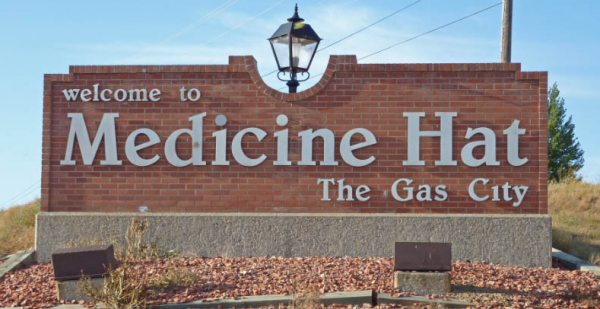 Provincially, the area is currently represented by Cypress-Medicine Hat MLA Drew Barnes and Cardston-Taber-Warner MLA Grant Hunter of the Wildrose Party and Medicine Hat MLA Bob Wanner of the New Democratic Party. This entry was posted in Alberta Politics and tagged Alberta By-Election, Blood Indian Reserve, Bob Wanner, Bud Olson, Canadian Alliance, Cardston-Taber-Warner, CFB Suffield, Church of Jesus Christ of Latter-day Saints, Cypress-Medicine Hat, Democratic Representative Caucus, Drew Barnes, Erin Weir, Glen Allan, Grant Hunter, Jim Hillyer, LaVar Payne, Medicine Hat-Cardston-Warner, Medicine Hat-Cardston-Warner by-election, Monte Solberg, Pierre Trudeau, Reform Party on March 31, 2016 by Dave Cournoyer. Two days later it is still hard to believe. The New Democratic Party won an election in Alberta? The NDP won a majority government in Alberta? 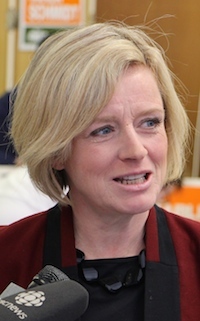 Rachel Notley is the next Premier of Alberta? Get used to it, because Albertans have spoken. A change in government is a good thing for Alberta. It was desperately needed. As I wrote on election night, it would be a mistake to believe this election signals Albertans have shifted to the political left.This election was never about ideology and Albertans remain largely politically moderate. This defining narrative of this campaign was trust and accountability, and on this issue Albertans turned away from Jim Prentice‘s Progressive Conservatives and embraced Ms. Notley’s moderate and progressive Lougheed-esq platform. The “time for a change” narrative was too strong for the PCs to survive. But it could still be a while before it stops sounding totally strange. I have never seen another party form government in Alberta until this week. The PCs were first elected 12 years before I was born. My parents were in junior high school when Peter Lougheed became Premier. 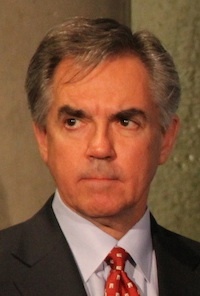 And this week that dynasty, which governed Alberta for forty-four straight years, collapsed in a spectacular fashion. Only one week ago, days before their defeat, the Tories revved up their impressive fundraising machine with a $500 per plate dinner in downtown Edmonton that raised around $800,000 in one night. A similar fundraising dinner, which I am told was sold out, is scheduled to be held on May 14 in Calgary. But now electorally demolished, on their way out of government and without a leader following Mr. Prentice’s election night resignation, will the PC Party go on? Who will show up for the pricy dinner now that there will be no Premier at the podium or cabinet ministers to dine and wine with? What is the future of the PC Party, now that it is no longer in government? Albertans wanted a change and they sent a message loud and clear. On Tuesday night, 74 new MLAs were elected. 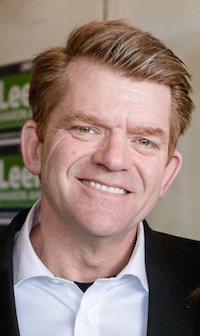 Forty-nine of those new MLAs will sit in the government benches and 20 will be in opposition, including 18 in the resurgent conservative Wildrose Official Opposition led by Brian Jean. The average age of Alberta’s MLAs also tumbled from 52 years old to 36 40 years old after this election and almost half of the NDP caucus will be made up of women MLAs. The government and opposition now hold differing political views, a difference from the past legislature which could help create an atmosphere of real debate in the Legislative Assembly. This marks a seismic change in a Alberta’s political environment that has been dominated by one party for four decades. 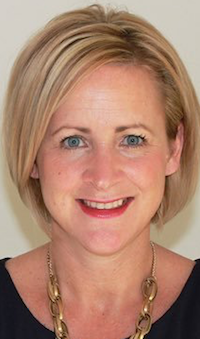 Any new government can be expected to make lots of rookie mistakes, but the incoming Premier has spent the days following the election to set a pragmatic and moderate tone for the new government. Ms. Notley made a point of using her first days after the election to set a positive tone with Alberta’s energy industry leaders, many who are also likely seeing their first change in government in Alberta. Ms. Notley has repeatedly made clear what Albertans already know: that energy industry is key to our economy. And the NDP Government’s proposed royalty review and modest increase to corporate taxes will ensure the role of Energy Minister remains very important in the new cabinet. Energy Minister could be a role so important that Ms. Notley takes it on the responsibility herself, as Mr. Prentice took on the extra roles of Aboriginal Relations and Intergovernmental Affairs when he became Premier in September 2014. While some fear-mongering conservatives, still bitter from their first electoral loss in 44 years, are predicting that the entire energy industry will pack up and leave because Albertans voted in a new government, there is an opportunity for corporate leaders to create a respectful working relationship with the new Alberta Government. And for Albertans, it could be refreshing change to have a government that acts like a partner with the energy industry rather than a wholly owned subsidiary of the energy industry. Albertans want to ensure they are getting their fair share of the wealth collected from their natural resources and industry, quite fairly, wants to know they will be treated fairly by the new government. As Ms. Notley’s NDP Caucus transitions into their new role as government, the first time this has happened in 44 years, there are still a lot of unknowns. When will a new budget be tabled? When will the Legislative Assembly sit next? Will there be any major changes in the senior ranks of the public service? Will Alberta’s position on major national issues drastically change? Who will be appointed to cabinet? We can expect incumbent NDP MLAs Brian Mason, David Eggen, and Deron Bilous to be at the cabinet table. 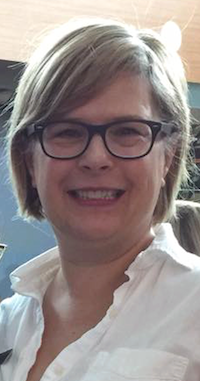 Other possible cabinet appointments could include Edmonton-Glenora MLA Sarah Hoffman (former Edmonton Public School Board chair), Calgary-Fort MLA Joe Ceci (former Calgary Alderman), Lethbridge-West MLA Shannon Phillips (policy analyst), Medicine Hat MLA Bob Wanner (former Public Services Commissioner for Medicine Hat), Edmonton-Whitemud MLA Bob Turner (Doctor), St. Albert MLA Marie Renaud (non-profit executive director), and Dunvegan-Central Peace-Notley MLA Margaret Mccuaig-Boyd (former Vice-President of Grande Prairie College), Calgary-Buffalo MLA Kathleen Ganley (labour lawyer), Athabasca-Sturgeon-Redwater MLA Colin Piquette (university instructor) and Calgary-Varsity MLA Stephanie McLean (criminal defence lawyer). And while their critics have focused on the perceived inexperience of new MLAs, we should not be surprised to see some of these unlikely politicians excel in their new roles. There will be a lot of unknowns in Alberta politics in the coming months and years. This is not a bad thing. In most provinces it is completely normal. We live in a democracy and can expect, from time to time, that voters will decide it is someone else’s turn to govern. Change is good. And while it still might be a while before it is easy to believe, Albertans sent a clear message on May 5 that they wanted a change in Edmonton, and they got it. On Wednesday morning I joined Ryan Jespersen and Steven Dollansky on 630 CHED to talk about this week’s historic NDP election win in Alberta, the Wildrose resurgence and the collapse of the 43-year old PC dynasty. This entry was posted in Alberta Politics and tagged Bob Turner, Bob Wanner, Brian Jean, Brian Mason, Colin Piquette, David Eggen, Deron Bilous, Jim Prentice, Joe Ceci, Kathleen Ganley, Margaret Mccuaig-Boyd, Marie Renaud, Peter Lougheed, Rachel Notley, Sarah Hoffman, Shannon Phillips, Stephanie McLean on May 8, 2015 by Dave Cournoyer. Now that the great orange chinook has finally put an end to 44 years of Progressive Conservative dominance, the hard job of governing Alberta has begun in earnest for Rachel Notley’s New Democratic Party. Among the many tasks the new MLAs face, one of their first and most important will be to choose a new speaker of the Alberta legislature. Notley’s caucus is filled mostly with newcomers, but that gives her a unique opportunity to reach beyond party lines for an experienced and steady hand to oversee the chamber: Liberal Leader David Swann. 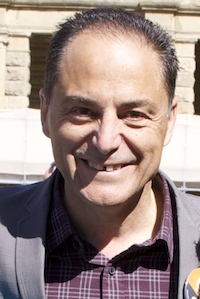 Pundits have already written extensively about the political inexperience of many of the 49 newly-elected NDP MLAs, though this group nevertheless boasts some very impressive talent, from Joe Ceci (a former 15-year Calgary alderman) to Sarah Hoffman (chair of the Edmonton Public School Board) to Bob Wanner (Public Services Commissioner for Medicine Hat). But it’s still fair to point out that the NDP ranks include only four MLAs with experience in the Legislative Assembly (counting Notley herself), and Notley will need all of them to assume top leadership positions in her cabinet. Swann’s 10 years of experience makes him well-qualified for the job, and his long record serving Albertans as a physician and human-rights activist suggests he’d offer a measure of humility and compassion that the legislature sorely needs. By going outside her own party, it would signal that Notley is planning a less partisan approach to governance, which would offer a welcome contrast to four decades of polarizing Tory rule. At the same time, it would be seen as an inclusive gesture to the province’s many Liberal voters, some of whom—even those who switched allegiances this time—undoubtedly have placed the NDP on probation. 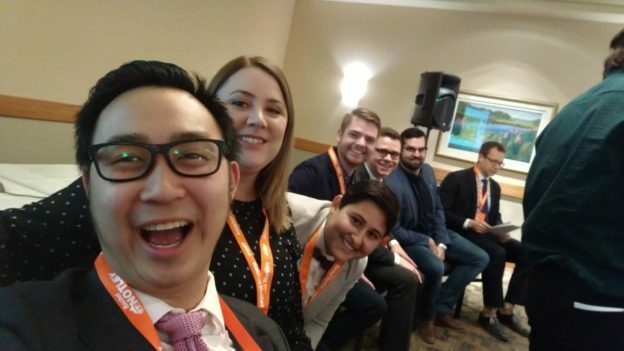 Notley’s crew will face a re-election battle sooner or later, and ensuring these voters become (or remain) part of the NDP’s coalition is a key goal. 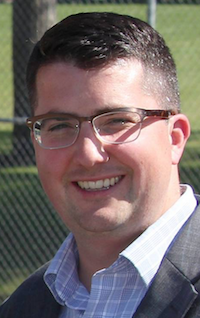 Not only would it be a magnanimous gesture on behalf of a longtime MLA who is about to represent his party as a caucus of one, it would place Swann in a neutral role where it would be difficult for him to act as an NDP critic. You can bet that the traditional media is eager to write their first stories about the “left in disarray”; this helps forestall that. Notley’s NDP has already made history in more ways than one: by becoming the first left-of-center party to win an Alberta election in 85 years; by electing the largest-ever number of women to the legislature; and by ending the longest reign of a political party in Canadian history. During those four decades, the Tories never once picked a speaker from outside of the PC ranks. That means Notley can add to her impressive list of firsts by selecting David Swann. It would be good for the NDP, good for the legislature, and above all, good for the province—and Alberta could certainly stand for that. 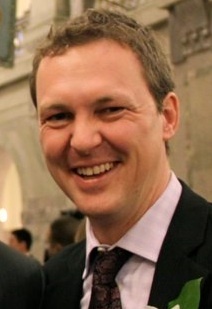 James Lambert is an Edmonton-based writer and lawyer by training. He is a contributing editor for Daily Kos Elections, a past political campaign staffer, and currently works in the field of alternative dispute resolution as an adjudicator. This entry was posted in Alberta Politics and tagged Bob Wanner, Brian Mason, Dave Rodney, David Swann, James Lambert, Joe Ceci, Rachel Notley, Sarah Hoffman, Speaker of the Legislative Assembly on May 7, 2015 by Dave Cournoyer.